Paestum (or the Archaeological Park of Paestum) has been a UNESCO World Heritage site since 1998. It is in Campania, Italy, and is an ancient Greek (then Lucanian, later Roman) settlement, with the best preserved Greek doric temples worldwide. It is surrounded by a Roman city wall, and is 40 km south of the city of Salerno. Most of the ancient Greek/Roman city has not been excavated yet. Three magnificent Greek temples, dating back to the colonization of Magna Graecia (Southern Italy), around the seventh century BC, are preserved together with other Greek and Roman ruins. The construction of the three temples is dated between 550 and 450 BC. Besides the three Greek temples, the site has an ancient gymnasium, amphitheater, city wall and tower ruins, and plenty of Roman house wall ruins. 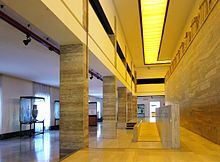 Adjacent to the main entrance to the archaeological area is a modern Archaeological Museum, displaying excavated items such as statues, vases, metalwork, and painted grave stones. The site has been a tourist attraction for centuries. It was a common destination on the Grand Tour of the 17th to 19th centuries, as an example of the Ancient Greek heritage. In these times, in fact, Greece was part of the Ottoman Empire. Paestum train station; archaeological site about 10-min walk west through the old city gate. A regional train goes from Salerno or Naples to Paestum station; it takes about 0.5 hr from Salerno (or 1.5 hr from Naples) to Paestum. The train is probably the fastest way to arrive with public transportation. Read about the unified public transport ticket Campania Unico. Buy your ticket to get out in one of the souvenir shops close to the museum or, better yet, before you go. No ticket sale anymore at the Paestum station and machine rarely works. The train station is located due east, within easy walking distance, of the archaeological park and museum. Ferry during summer months from Naples, Positano, Amalfi to Salerno. CSTP bus 34 leaves from Piazza della Concordia in Salerno by the base of the ferry dock roughly every hour and takes about one hour to get to Paestum. 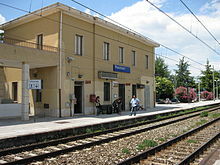 Alternatively, you could walk a few blocks from the Salerno ferry dock to the Salerno train station and take the train. Coaches run throughout the Campania regions, especially in Avellino province, picking locals up for various points and taking them to the site for €9 return. Drive along the motorway, take Battipaglia exit if you arrive from the North or the Eboli exit if you arrive from the South; then follow the highway and take the Paestum exit. The area in and around Paestum is flat and easy countryside to get around. A jpg map is available online. Here is the general layout. The ancient settlement is surrounded on all four sides by a Roman wall and gates on the four ordinates. 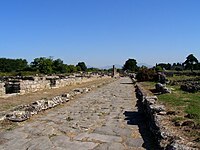 Via Magna Grecia is the modern road that cuts through the middle of the walled old city from north to south. Via Tavernelle or Via Porta Aurea is a modern road just outside the north city walls, and Via Nettuno or Via Porta Giustizia just outside the south city walls. The train tracks are outside the east city walls, and the beach outside the west city walls. The Archaeological Museum and the tourist information booth on Via Magna Grecia, natural focal points for any visit, are in the middle of the walled Paestum. From the train station, walk west through the old city gate (Porta Silena) and continue straight ahead about 10 minutes along a pleasant flat country road to a hotel on Via Magna Grecia, then turn right and walk north to the main entrance to the archaeological park and the two-story modern National Archaeological Museum. Buy your tickets for the archaeological park from the museum. The museum is also a good place for tourist information and rest rooms. Buses from Salerno stop on Via Magna Grecia near the south entrance to the archaeological park; to get to the main entrance, just walk north on Via Magna Grecia to the museum. From the historical site to the beach is about 30 minutes further to the west. Three ancient Greek temples. There are three magnificently preserved Greek temples on the Paestum archaeological site, but they have all been erroneously designated in the past. Even the signage on site and maps do not always match the most current attributions. The designations change because of newly excavated evidences of the use of the temples. Perhaps further research would call for changes in the current attributions, but that is a scenario for future travelers. For present day travelers, the Greek temple in the northern part of Paestum is identified as a Temple of Athena, and the two Greek temples in the southern part of Paestum are identified as two temples of Hera. All three temples are oriented east-west, with the front facing the rising sun. The oldest temple is the southern most one, the Temple of Hera I (also erroneously called Basilica), built around 550 BC. The temple is wider than most Greek temples, with nine columns across the front and eighteen along the longer sides (9x18). 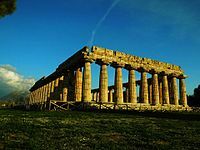 The next oldest of the three temples is the Temple of Athena (also erroneously called Temple of Ceres), built around 500 BC on the highest point of Paestum, which is north of the ancient center of town. It has six columns across the front and thirteen along the sides (6x13). 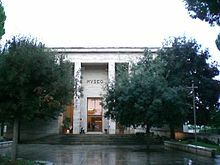 It is the first known temple in the world to mix the Doric columns of the main peristyle with the Ionic columns used in the porch (see Museum). The third oldest is the best preserved Greek temple in Paestum and perhaps the world -- the Temple of Hera II (also erroneously called Neptune Temple or Poseidon Temple), built around 450 BC. It is just north of the Temple of Hera I, and it has six columns across the front and fourteen along the sides (6x14). It belongs to a transitional phase between the archaic and the classic Doric order and incorporates subtle architectural refinements peculiar to the classic Doric order. For example, the base on which the columns rest is not completely horizontal, but humps up slightly in the middle along the sides to offset the illusion of sagging. The Temple of Hera II in Paestum is modeled closely after the Temple of Zeus in Olympia, foreshadowing the most celebrated classic Greek temple, the Parthenon in Athens. Other Greek features. In addition to the three majestic Greek temples, there are two other notable Greek archaeological features. One is Heroon, a Greek memorial tomb, c 520 BC, which sits unexpectedly in the middle of the settlement. Well preserved vases found in Heroon are on display at the Archaeological Museum. Across the street from the Museum is a sunken circular Ekklesiasterion, c 480 BC, a civic assembly area large enough for about 500, evidence that Paestum was a democratic Greek city-state. Roman ruins. In between the Athena Temple in the northern part of Paestum archaeological site and the Hera Temples in the southern part are many Roman ruins, including an amphitheater, house wall ruins, and Via Sacra, the main street of the ancient settlement. The Roman Forum was the ancient center of town. As with the Greek settlement, much of the ancient Roman settlement have yet to be excavated. Buffalo farms are famous for their mozzarella cheese. Buffalo mozzarella from Campania bears the "Mozzarella di Bufala Campana" trademark. After visiting the antiquities, relax at beach. All the souvenirs you forgot to buy anywhere else in Italy, and they are even cheaper than elsewhere. Small fake jumping athlete (from the grave frescos). Around the museum are plenty of Italian restaurants serving the standard food. Try the buffalo mozzarella cheese. It is enjoyed with calzone, vegetable, salad, on pizza, on grilled bread, with tomatoes, or by itself accompanied by olive oil. Holiday Village Parco Elena, Contrada Impiso, 84076, ☎ +39 0974 841491, fax: +39 0974 841491. Il Cannito Hotel (Il Cannito Hotel), Via Cannito, 84047 Paestum, ☎ +39 0828 1962277. Small luxury design hotel immersed in the green, 5 km away from Paestum center. Only 4 rooms, internal restaurant and panoramic terrace. Room rates from €200. 40.43629314.9793471 Oleandri Resort Paestum - Hotel Village Residence Club, Via Poseidonia 177. With a large outdoor pool, a hot tub and children's play area, the hotel is set in 30,000 m² of private parkland. The private beach is furnished with sun loungers and parasols. Accommodation is divided into hotel rooms and self-contained apartments. Free wired internet, Wi-Fi and parking. Wired internet is available in public areas and is free of charge. The main international hotel chains have their blocks at the beach. There is a agricultural farm that rents out beds run by a Belgian. Train to north or south only; 30 minutes north to Salerno; 1.5 hours north to Naples. In summer ferries to Amalfi Coast and Naples. This city travel guide to Paestum is an outline and needs more content. It has a template, but there is not enough information present. Please plunge forward and help it grow! This travel guide page was last edited at 12:49, on 13 January 2019 by Wikivoyage user Traveler100bot. Based on work by Wikivoyage users Ground Zero, Augustus divi caesar, Pepemanuele, MartinJacobson, Yvwv, Ira Leviton, Wrh2Bot and Traveler100, Wikivoyage anonymous user 83.211.5.64 and others.